Think changing one baby's diaper is hard? Watch this couple change the diapers of their triplets—they manage to make it look easy and even have a bit of fun. The Fortin family has no shortage of diapers to change. The family contains a set of triplets—so you can only image how many changes the Ryan and Desi Fortin go through on any given day. Three has been the magic number for Ryan and Desi, who struggled with infertility for three years before welcoming a set of triplets. Raising three children at once cannot be easy—but the family has managed to do it in the best way possible: With a strong sense of humor and a little bit of healthy competition. 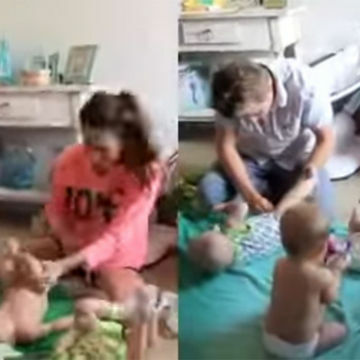 Ryan and Desi, who share family videos on their YouTube channel, clearly feel pretty good about their diaper-changing abilities because they faced off against one another in a challenge to determine who could change all three of their children faster. Watch them go toe-to-toe in an epic diaper changing face off—who do you think will win?